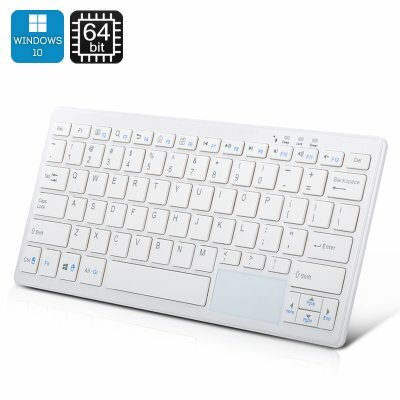 Successfully Added 72 Key Keyboard PC - Windows 10, Intel Quad Core CPU, 2GB RAM, Bluetooth, 32GB Memory (White) to your Shopping Cart. Turn any monitor into a computer instantly with this easy to install maintain and use keyboard PC. This Windows mini PC is a neat little 72 key keyboard with a spritely Windows 10 PC inside of it. At just 310 grams and measuring less than 30cm this small form computer is a portable convenient way to take everything you need with you. Just find a monitor or TV and you have an instant windows PC wherever you may be, no need to carry an extra keyboard with you as this has its own included. This Mini PC has 2GB of RAM and runs on an Intel Z3735F Bay Trail quad core processor that is clocked at 1.33GHz, but this has the benefit of Intel's burst technology allowing it to run at faster speeds when needed balancing performance with power consumption. The rear of the keyboard has ports for everything you need with two USB, HDMI, VGA Audio out and of course the DC power port. this means there's no hassle connecting to your TV or monitor and its simple enough to connect a mouse and other USB accessories. Coupled with that, the device supports external HDD up to 1TB so with its 32GB of memory and micro SD card slot there's no shortage of storage options. Whether you're using it for hot desking at work, want a portable device to take between school and home or just looking for a simple easy to use TV box the Wintel K3 delivers in spades. with the this Windows mini PC you have a powerful portable computer that's ready to use right out of the box. The 72 key keyboard computer comes with a 12 months warranty, brought to you by the leader in electronic devices as well as wholesale Windows Mini PCs..
As a wholesaler, we provide no software support, advice, or training regarding the operating system and software. Windows activation code included, to obtain the activation code scan the two-dimensional (QR) code on the bottom of the product. All went well, made a very good impression. But on second start screen went blue and text said just a moment cyclic dots stayed on for ever and nothing helped. I can throw it away, unless somebody gives me the right advise. Reset, several key combinations and hard reset advises nothing helped even 24 hours just a moment to no avail. Disappointed , Chinavasion doesnot give advise. Second start gave a blue screen with active cyclic dots and just a moment text.